"I'm your mother. You have to do what I say." It's hard to come up with something new in a series that has run this long, but they did it, didn't they? The resurrection of Mary Winchester and this strange family reunion she's experiencing with Dean and Sam deserves the time and dramatic weight that the writers are giving it. Even though it's all so awkward, it is also genuinely touching. Dean may be as happy about it as he says he is, but he's also struggling. He's used to being the boss and his first impulse is clearly to protect Mary, to keep her out of danger, instead of respecting her skills as a hunter or even obeying her as a mother. He wouldn't listen, even though Mary was right that Toni wouldn't be expecting her, promptly got the drop on her, and rescued her sons from that basement. Okay, with a little bit of help. Mary told Dean that she had dreamed about John, and talked about what a great father he was. But we know that John was not a great father. Mary never knew the John Winchester we knew, the one obsessed with hunting. Dean was the one who raised Sam; they had only each other. But maybe there's hope that they might find a way to make this new family situation work. The pie moment was absolutely lovely, especially Mary's expression as she was observing Dean's lack of table manners. The photos Dean was perusing while he was sprawled on the kitchen floor included Bobby, which was probably supposed to make us consider the possibility of Mary taking on Bobby's role as the coordinating home base parental-figure hunter. Wouldn't that be cool? I honestly don't want to see Mary die tragically in the mid-season finale. While Dean's interactions with Mary were all wonderful, that scene at the end with Sam was the strongest. Throughout the episode, Sam was looking at Mary like he looked at Chuck, as if he was in awe and couldn't quite believe she was real, while Mary, struggling with her guilt over giving baby Sam to old Yellow Eyes, was looking at the adult Sam as if she was trying and failing to connect him to the baby she knew. It was so sweet that Sam thought to bring her John's journal, a way to connect with the John that he and Dean knew and she didn't. That prop used to be such an important part of this series, but it's been gone for years. It was so nice to see it again. I guess I should discuss the despicable Toni, whom I am currently picturing as Lucifer's new pet when they eventually lock him back in the Cage. Somehow I'd gotten the impression in the previous episode that she wasn't into torture, maybe because she left the room while her minion was burning Sam. Not so. 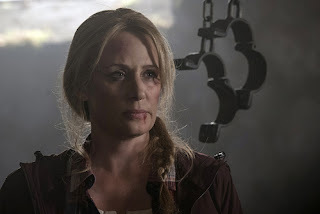 Toni certainly showed an interest and even delight in causing serious pain, especially when she was threatening Dean with a needle in his eyelid. That opening scene with the nonexistent four-poster bed and the candles made it clear that Toni really enjoyed the way she was mentally manipulating Sam, even when she wasn't causing him pain. And all that wasn't even in her mission parameters, according to new character Mick, who seems to be at a higher level in the BMoL organizational hierarchy than "her ladyship." The most interesting bit during the interrogation was when Toni brought up Ruby and Benny, which made it feel like old home week. I'm sure that was just "consorting with monsters" evidence she's twisting into the British MoL narrative that Dean and Sam are as bad as the monsters they hunt. But the whole thing really doesn't make a lot of sense. If the British MoL know that many intimate details about the Winchesters covering that many years, how come they don't see them as the heroes that they are? And how come no one has mentioned Chuck? You'd think Chuck's opinion of the Winchesters would have some weight. So Lucifer has a new vessel: Vince Vincente, an exhausted, alcoholic rock star who lost the love of his life to suicide. 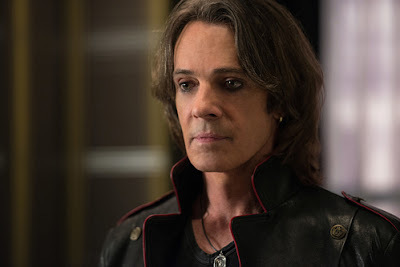 Rick Springfield is interesting casting. But Lucifer has been burning out vessels like cheap matches. Why go to the trouble of picking someone famous if he's going to burn out in a week? Is Vince a genetically bred vessel like the Winchesters? And may I add: Acid in the face. Gross, but well done in the effects department. It reminded me of Aaron Eckhart's character in The Dark Knight. The continuation of the Crowley and Rowena saga is also a son interacting with a mother he hardly knows, but the resemblance ended right there. It's surprising that Crowley and Rowena haven't killed each other yet. Maybe they're saving it for the season finale. Is it wrong of me to hope that Rowena manages to get away to hide in Boca Raton with her latest victim? I didn't like Rowena that much at first, but I've grown fond of her, almost in spite of myself. Castiel didn't get much to do in this episode. He mostly hung around the action getting blocked by warding and being unkindly referred to as a pet angel and attack dog. But at least he's Castiel now, and he was there for them. 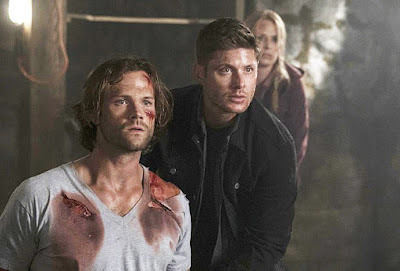 Sam, Dean and Mary all got pretty banged up, but looked fine in the end, so I can only assume Castiel healed them all. — Loved the Men of Letters symbol catching Dean, just like a devil's trap. It made perfect sense. — The body sliding down the hotel hallway was also awesome. — The dreaded Mr. Ketch will be arriving soon with two suitcases full of guns. How is he getting them across the pond? Another private plane, I assume? — This week: Aldrich, Missouri; a rock concert in Cleveland, Ohio; the MoL bunker. And, quite briefly, London. Dean: "Did you have a look inside?" Castiel: "No. It's powerfully warded." Dean: "Powerfully warded... okay, buddy, that was your headline right there." Castiel: "Are we still discussing the same thing?" Crowley: "What's the bloody holdup? He's the one and only Satan in the phonebook." Rowena: "It's witchcraft, not Google Maps." Crowley: "Lucifer. Wearing Vince Vincente, second-tier star. I would have thought Bieber was more your style. " Dean: "No, I just came by for some tea and a beating." Dean: "First off, who's Angry Spice?" Mick: "I reckon he could finish me off without breaking a sweat. Am I right?" Castiel: "I don't sweat under any circumstances." Mary: "We should call the Internet and find out as much as we can about these people." Lucifer: "I've got to say, Rowena, I took one look at you and all I wanted was to snap your miserable neck again and keep it snapped this time. But I think I've decided against it." Rowena: "You won't regret it, sir. I am done with all this. I'll stay far, far away, sipping martinis with Republicans at my tennis club." Sam: "For me, having you here fills in the biggest blank." Awww. Always wait for your review and never get disappointed. Not that it takes long to wait lol, fortunately, the reviews on this blog are always among the first to come. Thank you guys! I despise the Brit men of Letters...But i do appreciate the different type of problem they present..Dean and Sam won't just kill them...Yet. As they are humans..Also the powers they will be up against..That was a pretty nifty spell Toni used on Mary. I think the thing I was most pleased with in this episode was how they portrayed Mary as a hunter. She wasn't a helpless damsel, but she also wasn't a full-on badass like her boys. She came across as very capable but a little rusty, precisely how I would expect her to be. 2) Smart Dean does as well. Love it if Mary stands up for him when Sam or someone (something) else belittles his intelligence. Forgot to mention, great seeing Rick Springfield and I hope he can stick around a few episodes at least. I knew the opening teaser was misleading but it was a welcome sight. After having to endure an episode of Sam being tortured, seeing him shirtless in bed with a glass of wine was a real treat. So far, Mary's interactions with her grown-up sons have been the highlights of the season. The Men of Letters plot is making a bit more sense after we saw that Toni wasn't following orders, but even so her approach makes them seem more reckless and undisciplined than Sam and Dean. Loved the first two episodes of this season! I was unsure about Mary, but she feels like an interesting turn on the Winchesters dynamics. Can't wait to know more. But I have a question: where the hell is Sam tattoo? He really didn't make it again after Gadreel? That's dangerous! I still puzzled by BMOL motives as Toni thinks to end the supernatural threat in the US is too kill all hunters in the US and what send BMOL hunters in their place ? ?